This quote is so me. You look at my outfits and you mostly see monochrome, consisting of black, white, and greys. But if you could see inside me, you would see a plethora of color. I am a happy person. A person who lives without regrets. Never looks back, only forward. Doesn’t worry much, just worries when time calls for it. I am open and honest and I give everyone a chance, the benefit of the doubt. Fiercely loyal and passionate, but if you cross me I will quietly withdraw (you would never know it). I may wear neutrals, but if you ask me what my favorite color is, you won’t hear black, white, or grey. I may appear to be dark and moody, but inside I am a rainbow bursting into the cotton candy sky. I yearn for colors that enlighten me like yellow, pink, green…colors that make me smile. So what’s my favorite color? Why blue. And this is just another tidbit of me. I like the ease of a black, white, and grey ensemble. It’s classic, it’s bold, and it goes with everything. I paired this smocked, off the shoulder top with a fitted skort to create a minimal look. This skort is by Aritzia, a Canadian brand, which I discovered and love because the fit of their clothes is perfect for my body type. This skort has amazing details that I adore – the overlapping front panels, the foldover waist, and the soft, cotton jersey that stretches for a glove-like fit. For an everyday look I chose to dress down this outfit just a bit by adding my favorite Marc Fisher wedges and the softest cardigan from Press Fashions. I love a lightweight cardigan because I am always cold and the flow and drape of this piece creates a wonderful balance to the short skorts. I can easily dress this outfit up as well with a crisp, white, button down blouse tucked tightly into the skort with a pair of colorful, stiletto heels. If you had to pick a color, what color heel would you pair with this outfit? Thank you so much Airish! Yes, black and white always works. They are my go to colors! What a fabulous outfit, you look stunning! Thank you Camila, you can never go wrong with neutrals! Thank you Jenn. Another tidbit of mine is that I am a lover of quotes – any and all. Yes I scored these wedges early before they could run out of my size thankfully, but there are still a few left in stock. 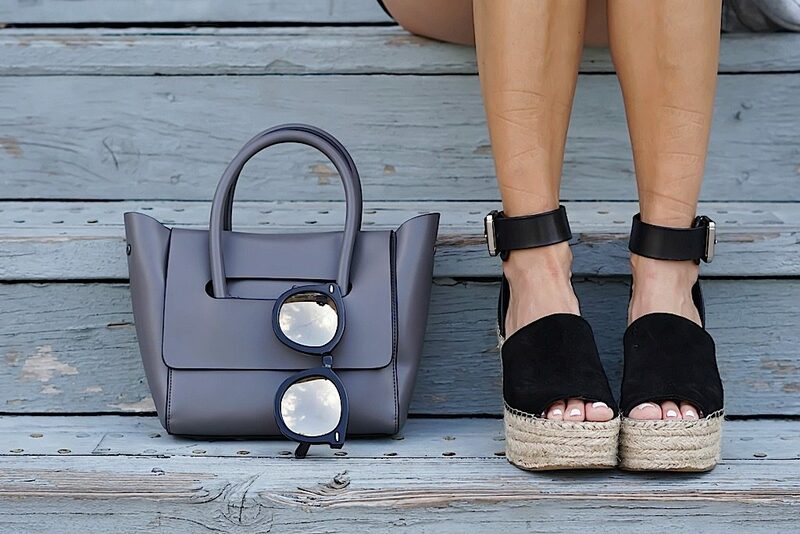 Loving those espadrilles! Very nice outfit! Yes they are my favorite and so comfy and chic. Thank you Tamara! Great outfit! I love a good monochromatic color. This is on point! Me too, monochromatic is my jam! I know, aren’t they fabulous and just $150! Thanks babe, can you believe it’s just minutes from my house? Have a fabulous weekend yourself Sharon! These are gorgeous photos! All of them! Oh noooo, missed so many great posts! Totally in love with the stunning long cardigan! Yes, I am all about layering and this cardigan is the perfect layering piece for year round. Thank you so much Katie, that means a lot.